My mother is an abstract expressionist painter who creates art using oil paints, acrylics, watercolors, and pen and ink. My father has a Masters degree in physics and spent most of his career working as a software engineer. As a result, I have born witness to many conversations about the intersection between art and science throughout my life. In fact, my first memory of discussing career paths involved my mom and dad deciding that I was meant to be an architect, since I possessed my dad’s aptitude for math and my mom’s love of design. Obviously, this attempt at predicting the future wasn’t quite on target. Nevertheless, my career as an oceanographer has combined some aspects of both art and science, as I will discuss below. 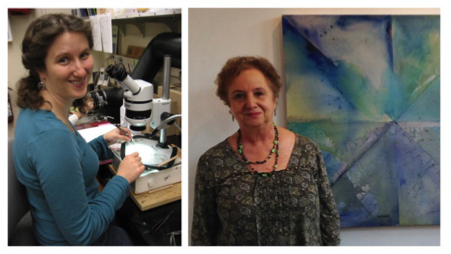 The author and her mother (Clare Asch) hard at work practicing science and art. Since becoming a marine scientist, I occasionally have conversations with my mother and stepfather, who is a classically trained guitarist, about the role of creativity in the working life of scientists. From these conversations, I have come to realize that artists and scientists talk about the intersection between science and art in different ways. However, both groups tend to emphasize the process through which art and science are created. Here I argue that this emphasis on process may be overstated. 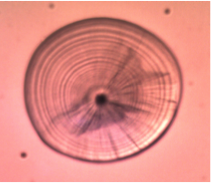 An otolith extracted from a larval Pacific sardine (Sardinops sagax). 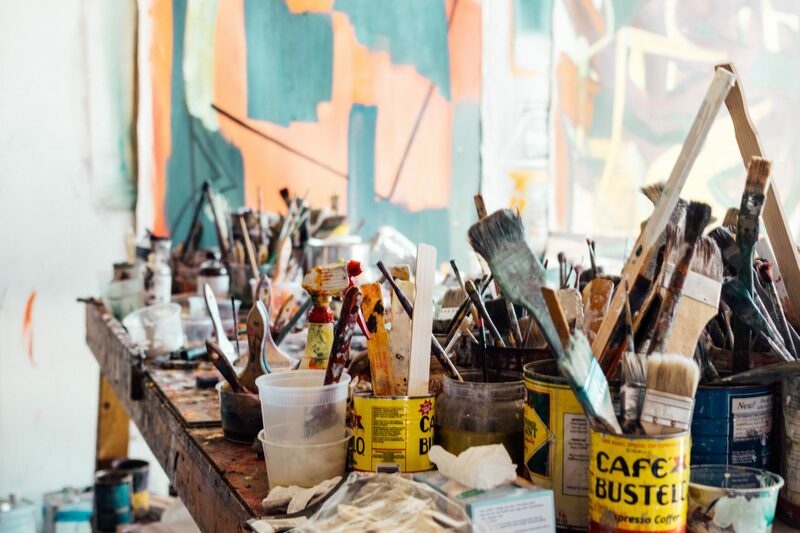 On the other hand, artists who emphasize the intersection between art and science tend to believe that the scientific process involves much more creativity than it actually does. In the popular vision of science shared by the general public and many artists, scientists are constantly having “Eureka!” moments when they think of big ideas that alter the understanding of established paradigms. While such “Eureka!” moments do happen, they are not as central to the scientific process as many non-scientists would believe. Bursts of creativity occur as scientists think of novel, yet testable, hypotheses. However, experimentally testing such hypotheses can take months to years of work that is often very repetitive – collecting hundreds of samples from the ocean using the exact same technique, setting up experiments so that all replicates are exposed to identical conditions, etc. Even scientific writing involves relatively little creativity in the “artistic sense” since scientific journals require use of precise and concise language. Left: Colormap image from the North Atlantic showing gradations in the variability of phenology of phytoplankton and fishes. Credit: Rebecca Asch. Right: Argus Peacock, watercolor on paper. Credit: Clare Asch. Where does this discussion leave us? If the intersection between art and science can’t be pinpointed when considering the processes of making art or doing science, where does this intersection occur? I would argue that part of this intersection occurs in the context of products developed by artists and scientists. One of the key products of scientific research is a set of figures that visually depict the results of a study. Like artists, scientists often spend substantial amounts of time perfecting this visual representation of their work. In fact, many experienced scientists recommend that scientific papers should be wholly constructed around the story told by their figures. Recognizing the artistic value of scientific figures, a suite of competitions has recently cropped up in which scientists submit images that are of both artistic and scientific interest. Examples of such competitions include the BioEASI Competition held at the University of California San Diego and the Art of Science Competition at Princeton University. Within this context, I would like to conclude by highlighting some similarities between paintings created by my mother and “colormap” figures that I designed as part of my research. In Matlab parlance, “colormaps” refer to figures created to represent three-dimensional data, where the third dimension is indicated by gradations of different colors. In oceanography, colormaps are frequently used to show how different oceanic properties (e.g., temperature, salinity, dissolved oxygen) change across depth and latitude. Left: Piroska, oil on canvas. Credit: Clare Asch. Right: Colormap image showing the mean date of the termination of phytoplankton blooms in the North Pacific. Credit: Rebecca Asch. 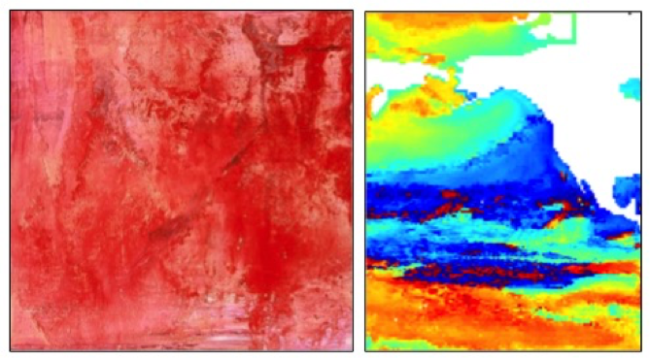 In the examples shown above, my colormap images are displayed side by side with my mother’s abstract paintings. In the first example, both the colormap of the North Atlantic and the painting Argus Peacock illustrate the flow of water. The colormap shows oceanic currents whose meandering path results in high variability of biological properties. Similarly, the intense blue spots surrounded by black contour lines in Argus Peacock were created by the flow of water over the canvas. The second example highlights how both artists and scientists use variations in the intensity/saturation of colors to convey messages. In conclusion, I’d like to invite you to discuss how you think art and science intersect. Do you agree or disagree with the premises that I laid out? Are the artistic and scientific processes of creation more similar than I propose? How can we, as scientists, better design images that have both artistic and scientific merit? Will the use of such imagery help to convey scientific messages to a broader audience of laypeople? Rebecca Asch is a fisheries oceanographer whose research focuses on the interaction between climate and fisheries. As a Senior Nereus Fellow, Asch is using an Earth System Model developed at the NOAA Geophysical Fluid Dynamics Laboratory (GFDL) to examine future changes in the seasonal timing of fish spawning and phytoplankton blooms. This research investigates the hypothesis that climate change could lead to an increased frequency of “mismatches” between these seasonal events. In turn, such mismatches may potentially lead to poor feeding condition for fish larvae, slower growth of young fishes, lower recruitment, and ultimately decreased productivity of fisheries. If you are interested in seeing more artwork by Clare Asch, please visit www.clare-asch.com.